Another specialty of Kanyakumari is that it is one of the rare places in the world where you can see the sunrise and sunset at the same beach. A lot of tourist comes to visit Kanyakumari, just to witness this unique sunset and sunrise phenomenon. One of the important and ancient landmarks is the Temple dedicated to Goddess Kumari, which is situated on the seashore at the very junction of the three water bodies. This temple is considered as a highly spiritual place by the Hindus and people from all religion visit this temple during their trip to Kanyakumari in Tamil Nadu. The Vivekananda Rock Memorial is another major tourist attraction in Kanyakumari and your trip to Kanyakumari is never complete without visiting this amazing rock memorial. The rock is situated in the sea waters and is around 500 meters away from the mainland and people those who wish to visit this rock has to travel by boats which are available. 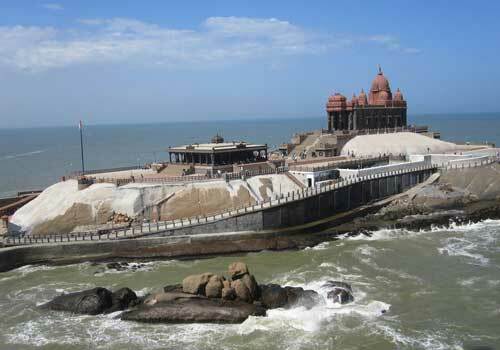 The Vivekananda Rock memorial is built on a rock and is a perfect blend of the different Indian architectural styles. It is believed that Swamy Vivekananda had meditated on this rock for 2 days before his departure to Chicago in 1893 to attend the World Religious Conference. The memorial took around 2081 working days to get completed and an average of 650 men worked hard behind the construction of this rock memorial. The Vivekananda Rock Memorial, Bhagavathi Amman Temple, Thanumalayan Temple, Kanyakumari Beach, Thiruvalluvar Statue, Thirparappu Falls, Gandhi Memorial, Baywatch Amusement Park, Vattakottai Fort, Mathur Aqueduct, Kanyakumari Wax Museum, Tsunami Monument etc are some of the major places and attractions in and around Kanyakumari which are worth visiting. You cannot cover all the major attractions and destinations in Kanyakumari in a single day and hence it is recommended to take atleast 3-4 days to get a complete overview of this amazing travel destination in Tamil Nadu. There are a good number of luxury and budget hotels/resorts in and around Kanyakumari, and it would never be difficult for you to find an accommodation except in peak tourist seasons. The hotels, resorts and lodges in Kanyakumari is well equipped with all the modern basic facilities and amenities. 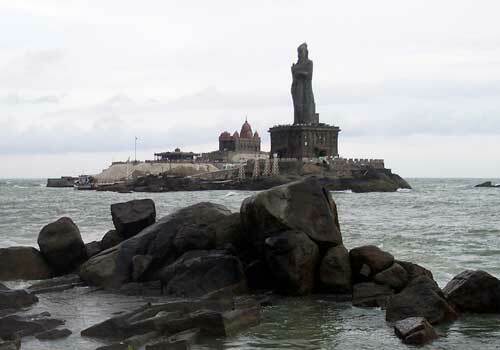 Kanyakumari is well connected to the other major Indian cities by rail and road which makes it easier to access. Kanyakumari does not have an airport and the nearest airport to Kanyakumari is the Thiruvananthapuram Airport in Kerala which is around 93 kms away from Kanyakumari. For those coming for the first time do not need to panic about visiting the major travel destinations, as a lot of educated travel guides are available for your help. 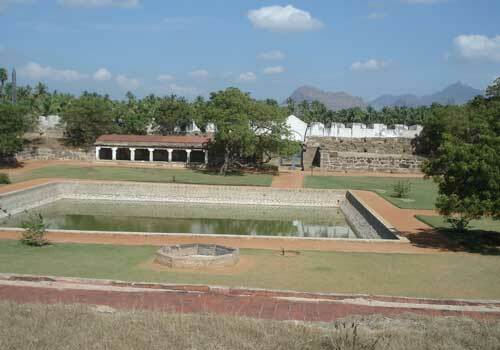 This entry was posted in Kanyakumari and tagged kanyakumari india, kanyakumari tamil nadu, kanyakumari travel, kanyakumari travel attractions, travel destinations kanyakumari. Bookmark the permalink.